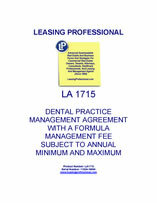 This management agreement form is designed to document the management of a dental group practicing dentistry managed by a dental practice management firm. In this case, the dental service provider includes subsidiaries covering periodontic, endodontic, and oral surgery specialties. The agreement specifies the authority and responsibilties of the practice manager for the administration and business management of the dental practice. Duties of the manager include arranging for equipment, supplies, non-dentist personnel, provision of office and clinic space, financial record keeping, and patient billing and collection, among other duties. 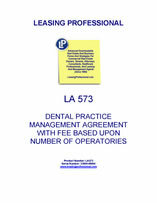 The management group is compensated by an annual service fee calculated by subtracting dental provider expense from the adjusted gross revenues of the dental practice, subject to an annual minimum and maximum management fee. The practice of dentistry is left to the dental group under the agreement.